The Entertainment Software Association study also found that there are a lot more adult females playing games these days than teenage boys. It may or may not be true that chicks cannot hold their smoke (dat's what it is), but it is an indisputable fact that they play a lot of video games - virtually as many as the dude half of the gaming audience, according to the Entertainment Software Association's 2014 Essential Facts About the Computer and Video Game Industry report. The study found that 59 percent of of Americans play video games, and of that number, 52 percent are male and 48 percent are female. I don't know about statistical significance, but where I come from that's close enough to half-and-half to call it. Some other interesting facts: The average age of the "most frequent" video game purchaser is 35, and the male/female divide among them is a straight-up 50/50. 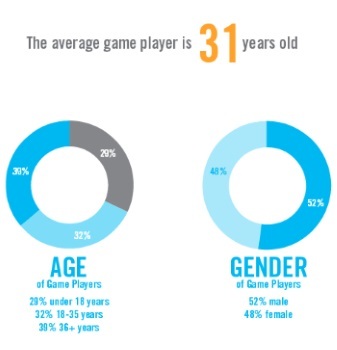 The number of female gamers aged 50 and older increased by 32 percent between 2012 and 2013, and women aged 18 or older now represent 39 percent of the game-playing population, compared to the relatively piddling 17 percent made up of males aged 18 or younger. In the "Turning Kids Into Killers" department, 91 percent of parents whose children play games reported that they are present when the games are purchased or rented, and 87 percent said that parental controls on consoles are "useful." Only a little more than half - 56 percent - described video games as a "positive part of their child's life," but a whopping 95 percent said they "pay attention to the content of the games their children play." "People of all ages play video games," Jason Allaire, associate professor of psychology at North Carolina State University and co-director of the Gains Through Gaming Lab, said. "There is no longer a 'stereotype gamer,' but instead a game player could be your grandparent, your boss, or even your professor." The ESA figures bear that out, but I think declaring that there's no longer a "stereotype gamer" is maybe a bit optimistic. Gaming is universal but gamers themselves can sometimes be a little less flexible in their attitudes, and stereotypes have a way of dying hard, especially when their foundations are viewed with suspicion by a significant portion of the population. The wheels are turning, but we've got a way to go yet.